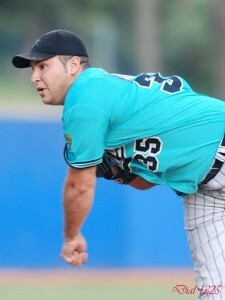 The 25-year-old left-handed pitcher Ivan Granados has agreed to play for T&A San Marino in the 2011 season. He is leaving the Tenerife Marlins Puerto Cruz to join the club where his Spanish national team manager Mauro Mazzotti is working as general manager since October. He was born in Venezuela and played in professional baseball for the Oakland Athletics in 2005 and 2006 in the Arizona Summer League. After his release Granados joined CB Sant Boi in the Spanish Division de Honor. Since 2008 he was wearing the jersey of the Tenerife Marlins. The southpaw made his Spanish national team debut in 2007. In 2010 he had a 13-2 record with an ERA of 1.93 in 17 games (16 starts). He struck out 149 batters in 112 innings, while walking 32. It is expected that Granados is taking over as starting pitcher in game two each week for San Marino. However the Titans are still looking to finalize the pitching staff. They already have brought in outfielders Laidel Chapelli and Lorenzo Avagnina, designated hitter Jairo Ramos Gizzi, first baseman Wuilliuans Vasquez, catcher Mattia Reginato and pitcher Pete Avvento this offseason.